30-year fixed-rate mortgage (FRM) averaged 3.99 percent with an average 0.5 point for the week ending January 11, 2018, up from last week when it averaged 3.95 percent. A year ago at this time, the 30-year FRM averaged 4.12 percent. 15-year FRM this week averaged 3.44 percent with an average 0.5 point, up from last week when it averaged 3.38 percent. A year ago at this time, the 15-year FRM averaged 3.37 percent. 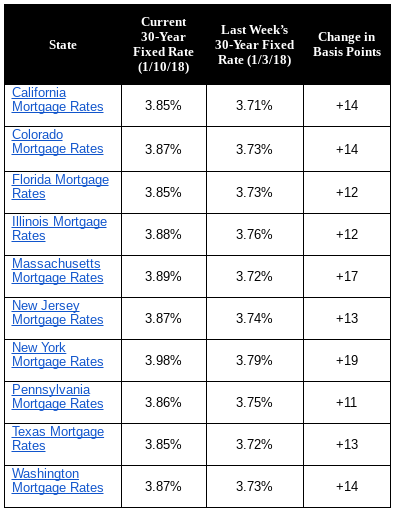 5-year Treasury-indexed hybrid adjustable-rate mortgage (ARM) averaged 3.46 percent this week with an average 0.4 point, up from last week when it averaged 3.45 percent. A year ago at this time, the 5-year ARM averaged 3.23 percent. “After dipping slightly last week, Treasury yields surged this week amidst sell-offs in the bond market,” said Len Kiefer, deputy chief economist. “The 10-year Treasury yield, for instance, reached its highest point since March of last year. Mortgage applications for new home purchases increased 7.8 percent compared to December 2016. Compared to November 2017, applications decreased by 18 percent relative to the previous month. This change does not include any adjustment for typical seasonal patterns. Conventional loans composed 72.5 percent of loan applications, FHA loans composed 15.1 percent, RHS/USDA loans composed 2.3 percent and VA loans composed 10.1 percent. The average loan size of new homes increased from $337,427 in November to $339,203 in December. The MBA estimates new single-family home sales were running at a seasonally adjusted annual rate of 554,000 units in December 2017, based on data from the BAS. The new home sales estimate is derived using mortgage application information from the BAS, as well as assumptions regarding market coverage and other factors. The seasonally adjusted estimate for December is a decrease of 16.4 percent from the November pace of 663,000 units. On an unadjusted basis, the MBA estimates that there were 40,000 new home sales in December 2017, a decrease of 14.9 percent from 47,000 new home sales in November. “After playing catch-up for 2 months following the slowdown caused by hurricanes Harvey, Irma and Maria, mortgage applications for new homes declined in December to a more normal growth rate of 7.8% on a year over year basis,” said Lynn Fisher, MBA Vice President of Research and Economics. The 30-year fixed mortgage rate on Zillow Mortgages is currently 3.88 percent, up twelve basis points from this time last week. The 30-year fixed mortgage rate stayed around 3.76 percent for most of the last week, and has climbed steadily since Monday. The rate for a 15-year fixed home loan is currently 3.29 percent, and the rate for a 5-1 adjustable-rate mortgage (ARM) is 3.40 percent. The rate for a jumbo 30-year fixed loan is 4.04 percent. “Mortgage rates moved decisively higher this week as markets returned from the holiday season with vengeance, touching their highest levels since July,” said Aaron Terrazas, senior economist at Zillow. 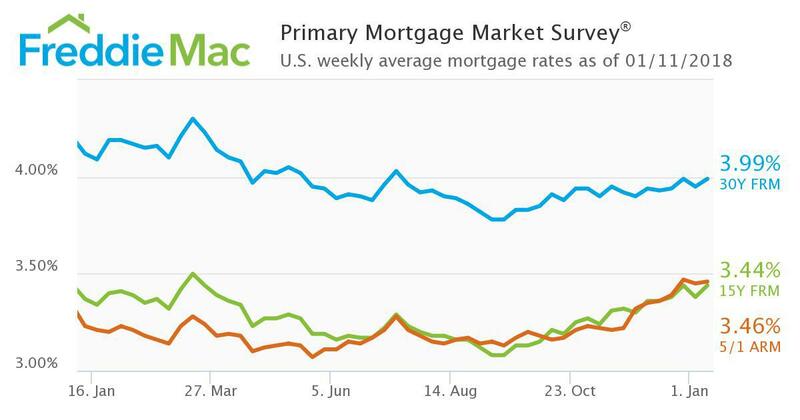 “Mortgage rates are still lower than they were a year ago, but the momentum is clearly on an upward trend, as markets grapple with a growing consensus that the American economy is at full capacity, softer international demand for US debt, and larger fiscal deficits on the horizon. The Market Composite Index, a measure of mortgage loan application volume, increased 8.3 percent on a seasonally adjusted basis from one week earlier. On an unadjusted basis, the Index increased 46 percent compared with the previous week. The Refinance Index increased 11 percent from the previous week. The seasonally adjusted Purchase Index increased 5 percent from one week earlier. The unadjusted Purchase Index increased 44 percent compared with the previous week and was 1 percent lower than the same week one year ago. The refinance share of mortgage activity increased to 52.9 percent of total applications from 52.1 percent the previous week. The adjustable-rate mortgage (ARM) share of activity decreased to 5.0 percent of total applications. The FHA share of total applications increased to 11.1 percent from 10.8 percent the week prior. The VA share of total applications remained unchanged from the week prior at 11.4 percent. The USDA share of total applications decreased to 0.7 percent from 0.8 percent the week prior. The average contract interest rate for 30-year fixed-rate mortgages with conforming loan balances ($453,100 or less) increased to 4.23 percent from 4.22 percent, with points decreasing to 0.35 from 0.37 (including the origination fee) for 80 percent loan-to-value ratio (LTV) loans. The effective rate remained unchanged from last week. The average contract interest rate for 30-year fixed-rate mortgages with jumbo loan balances (greater than $453,100) increased to 4.16 percent from 4.14 percent, with points increasing to 0.23 from 0.22 (including the origination fee) for 80 percent LTV loans. The effective rate increased from last week. The average contract interest rate for 30-year fixed-rate mortgages backed by the FHA decreased to 4.16 percent from 4.17 percent, with points increasing to 0.42 from 0.40 (including the origination fee) for 80 percent LTV loans. The effective rate decreased from last week. The average contract interest rate for 15-year fixed-rate mortgages increased to 3.66 percent from 3.64 percent, with points increasing to 0.42 from 0.34 (including the origination fee) for 80 percent LTV loans. The effective rate increased from last week. The average contract interest rate for 5/1 ARMs decreased to 3.50 percent from 3.53 percent, with points decreasing to 0.51 from 0.53 (including the origination fee) for 80 percent LTV loans. The effective rate decreased from last week. On average, appraised values were 0.50 percent less than what homeowners estimated in December, according to the National HPPI. The gap between the appraisal and homeowner estimates narrowed slightly since the previous month when appraiser opinions were 0.67 percent lower than homeowner expectations. Home values rose 0.65 percent from November to December and increased 6.17 percent compared to the previous December, according to the National HVI. “Appraisers and real estate professionals evaluate their local housing markets daily,” said Bill Banfield, Quicken Loans Executive Vice President of Capital Markets. “Homeowners, on the other hand, may only think about their housing market when they see ‘for sale’ signs hit front yards in the spring or when they think about accessing their equity. Delinquencies fell in one home-related category and rose slightly in the other two. 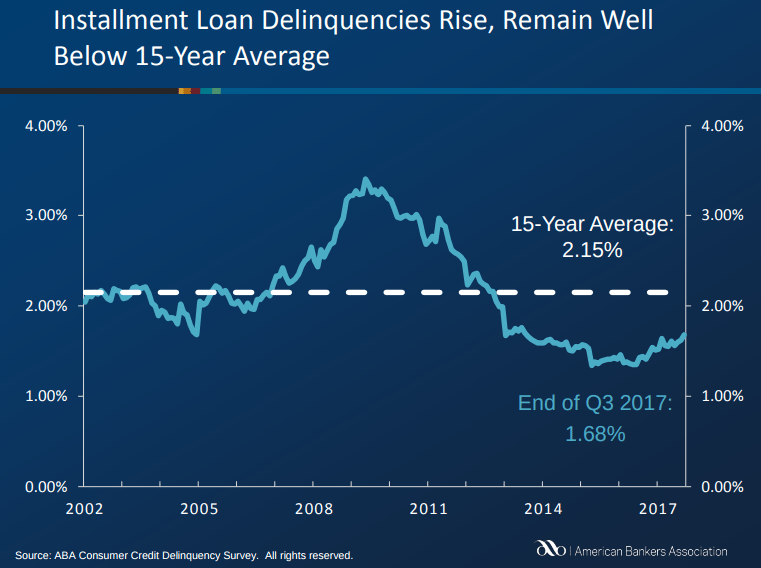 Home equity loan delinquencies fell 8 basis points to 2.42 percent of all accounts, dipping further under their 15-year average of 2.93 percent. Home equity line of credit delinquencies edged up 1 basis point to 1.08 percent of all accounts and remain below their 15-year average of 1.18 percent. Property improvement loan delinquencies rose 13 basis points to 1.08 percent of all accounts, but also remain well below their 15-year average of 1.32 percent. “Home-related delinquencies continue to show overall improvement as the housing market gains strength,” said James Chessen, ABA’s chief economist. The MCAI decreased 1.8 percent to 179.2 in December. A decline in the MCAI indicates that lending standards are tightening, while increases in the index are indicative of loosening credit. 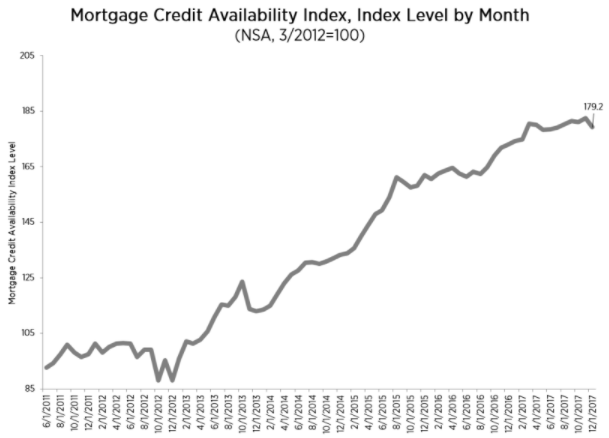 The index was benchmarked to 100 in March 2012. The Conventional MCAI fell less (down 0.7 percent) than the Government MCAI (down 2.6 percent). The component indices of the Conventional MCAI both fell from the month prior, with the Conforming MCAI falling less (down 0.1 percent) than the Jumbo MCAI (down 1.4 percent). “In December a handful of investors made end of the year adjustments to their menu of offerings,” said Lynn Fisher, MBA’s vice president of research and economics. “This resulted in a net decrease in credit availability for government backed programs (FHA/VA/USDA), and especially for lower credit score, higher loan-to-value loans, as well as streamline (requiring less documentation) refinances. “After rising in September, early-stage delinquencies declined by 0.1 percentage points month over month in October,” said Dr. Frank Nothaft, chief economist for CoreLogic. “The temporary rise in September’s early-stage delinquencies reflected the impact of the hurricanes in Texas, Florida and Puerto Rico, but now the impact from the hurricanes is fading from a national perspective. “While the national impact is waning, the local impact remains. Some Florida markets continue to see increases in early-stage delinquency transition rates in October, reaching 5 percent, on average, in Miami, Orlando, Tampa, Naples and Cape Coral. The Fannie Mae Home Purchase Sentiment Index (HPSI) decreased 2.0 points in December to 85.8, reversing last month’s rise. The decrease can be attributed to decreases in four of the six HPSI components. The net share of respondents who said now is a good time to buy a home decreased 5 percentage points compared to November and is down 8 percentage points compared to the same period last year. Meanwhile, the net share who reported that now is a good time to sell a home remained flat and is up 21 percentage points year-over-year. 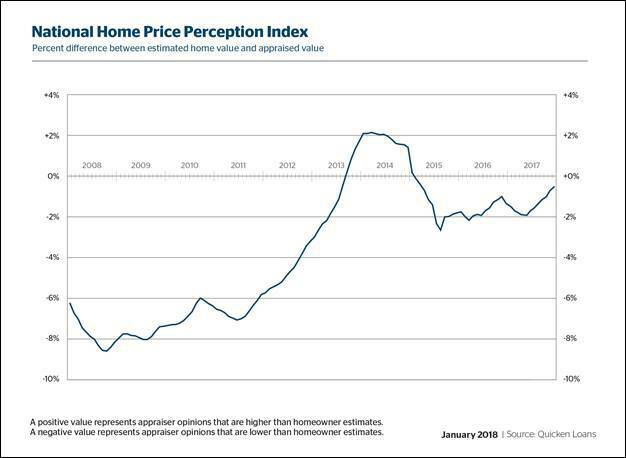 The net share who said home prices will go up in the next 12 months decreased 2 percentage points in December, while Americans also expressed a weakened sense of job security, with the net share who say they are not concerned about losing their job decreasing 6 percentage points. Finally, the net share of consumers who said mortgage rates will go down over the next 12 months fell 1 percentage point in December, while the net share reporting that their income is significantly higher than it was 12 months ago rose 2 percentage points. “Consumers remained cautious in their housing outlook at the end of 2017, as tax reform discussions continued,” said Doug Duncan, senior vice president and chief economist at Fannie Mae. “In December, mirroring the other major consumer sentiment benchmarks, the HPSI reflected this caution and declined slightly.